As a FAME (Formative Assessment for Maryland Educators) Leader at the district and school level, I have found, and believe, that the formative assessment process is one of the single most important things that educators can do for their students. The statement “formative assessment is a verb, not a noun” truly articulates that formative assessment is a process… not an event, questions on a piece of paper, or even an app. What makes an assessment formative is the context in which it is used. The Maryland Department of Education defines “Formative Assessment” as “a process used by teachers and students during instruction that provides feedback to adjust ongoing teaching and learning to improve students’ achievement of intended instructional outcomes.” By utilizing the 5 Critical Attributes of Formative assessment, this deliberate process can truly transform a teacher’s practice, but can also be transformational for their students. As a school administrator, I have watched and observed teachers who participated in our FAME Cohort transform their practice and implement these critical attributes. I have also observed how powerful the process of formative assessment is in their classrooms and its impact on student growth. As I went through the FAME Cohort with my teachers, I too began to transform my own practice as an administrator and instructional leader. I found that collaborating with teachers through formative assessment allowed me to provide more descriptive feedback to them. It also allowed me to support teachers in their own learning to improve instructional practice. During my introduction to FAME, my leadership efforts were focused around Critical attributes 3 and 5 (descriptive feedback and collaboration). Naturally, I then began thinking of ways to incorporate all 5 Critical Attributes of Formative Assessment that provides feedback to teachers and can be leveraged to improve instructional practice that impacts student learning. When teachers develop SLOs (Student Learning Objectives), they identify a specific learning goal and a specific measure of student learning used to track progress toward that goal. Within the process of developing a Student Learning Objective, teachers must also identify the professional development, materials, and resources that will support their instruction and assist students in meeting their growth target. My vision this school year is to work with teachers to develop an instructional goal, connected to the teacher SLO, that will help shape their overall approach to instruction and will facilitate students in attaining the long-term academic goal. Where are they going? Where are they now? How will they get there? 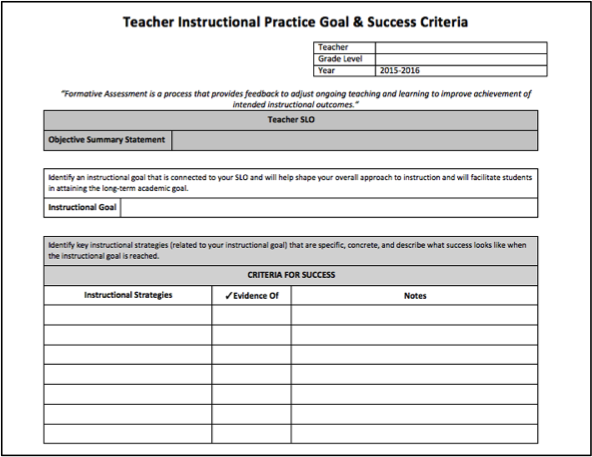 From the teacher instructional goal, I collaborate with individual teachers to develop a Criteria for Success that will identify key instructional strategies (related to the instructional goal) that are specific, concrete, and descriptive of what success looks like when the instructional goal is reached. 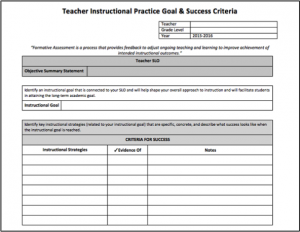 Clarifying expectations within instructional practices that can help them meet their instructional goals. Obtaining feedback around their instructional practices related to their Student Learning Objective. Providing descriptive and specific feedback that encourages reflection. Developing next steps to refine instructional practice related to the teacher’s instructional goal. As an instructional leader, I feel it necessary to utilize the formative process to engage both teachers and myself in dialogue, descriptive feedback, and reflection around instruction. By utilizing the 5 Critical Attributes of Formative Assessment in a coaching method with teachers, I can provide feedback to teachers that will promote the improvement of instructional practice, but also impact student learning. In turn, I am hoping this process will promote self and peer assessment, as well as lead to a collaborative culture where we are all partners in improving learning and instruction. Furthermore, this process will help teachers feel comfortable in taking instructional risks and becoming empowered to take ownership of their own learning process. 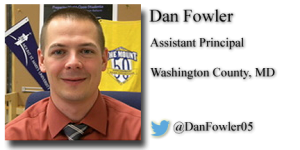 Dan Fowler is an Assistant Principal in Washington County, MD. 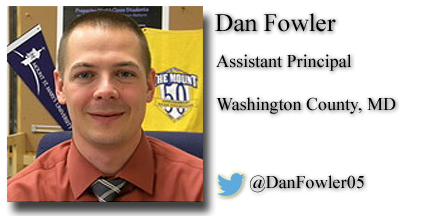 He shares his insights on his website, Habits of Reflective School Leadership. Follow Dan on Twitter at @DanFowler05.